Moira Buffini, an award winning, British playwright has brought us a treasure through the revival of her 1997 play, Gabriel. She has created a visceral, intimate feeling onstage, based on complex characters, including a quixotic 10 year old girl, women protecting their lives and families during 1943 WWII, with a Nazi officer thrown into the mix. Our collective consciousness enters the mysterious and somewhat ethereal island of Guernsey, part of the Archipelago in the English Channel. Gabriel presents more questions than answers. Characters within the story move like poetry, limited only by time and space, on an island with a few British farmers, occupied by Nazi’s, and a family holding many secrets in a small, yet comfortable farmhouse. Jeanne Becquet’s husband has been killed in the war, with her son Miles presumed dead in action. Her daughter-in-law Lily is Jewish, her existence presenting danger to herself and those around her. Jeanne’s daughter Estelle, meaning star, although only 10 is precocious and questions their reality, replacing it with mystical dreams. Although the women argue, often at odds with one another, a co-dependency forms as well. A theme of loneliness, grief, fear and at times desperation prevails, along with a story of passion unfolding, conveying the will to survive. 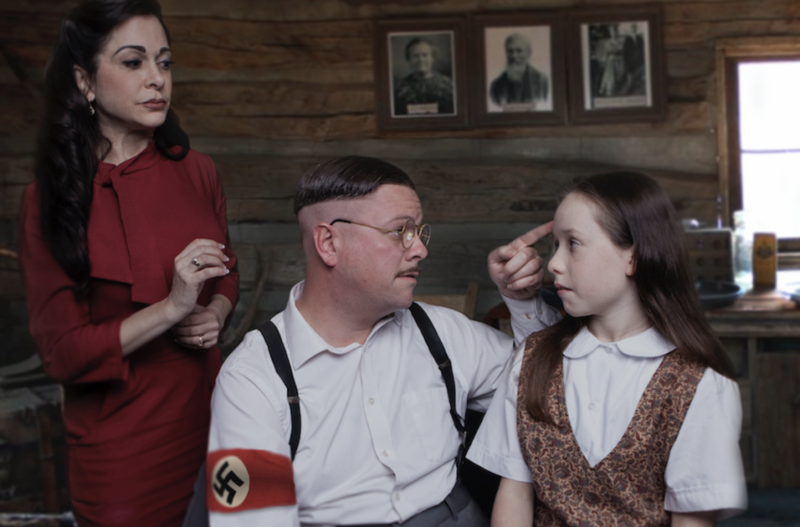 Sinister Major Von Pfunz, is a poetic yet ideologically German officer, holding the key to this family’s survival. The audience need not be fooled as he inhabits this family’s space, vacillating between a seemingly protective figure, both ominous and mercurial at the same time. His intense attraction to Jeanne, is powerful, yet she needs to be mindful, as she has gone swimming in this dangerous pond once before. Repulsed by what he stands for, Jeanne relies on him to protect her family living in a state of perpetual anxiety. The housekeeper, Margaret Lake serves as a backdrop of stability and reminds them of the life they once had while they lived in a large, fine home on the island which is now Nazi occupied. She flits around, attempting to keep everything under control in an often unmanageable situation. The sense of loss is profound, exhibited by brothers, husbands and sons, all fallen soldiers. These women derived protection and a sense of security from their men for years. How will they cope under circumstances where they have no control? Their lives are forever changed, with Nazi soldiers banging on their door, reminding them often of their helplessness. The stage becomes a metaphor for their feelings of entrapment. One begins to feel a sense of inertia until the unforeseen occurs. A handsome, yet unconscious man washes up on shore, brought home by Lily and Estelle. The sense of ambiguity is extraordinary as all wonder who or what he represents. Once conscious, he speaks both English and German fluently, yet appears to know nothing of the war. Major Von Pfunz believes him to be a missing German SS leader while others feel he may be an officer of the Royal Air Force. Estelle names him for the angel Gabriel, believing he may be sent from G-d as a messenger to heal and save them. With no identification or memory, could he be an ethereal being fallen from the sky? Each of them falls in love with him in their own way, while placing an imprint on him he may not be able to live up to. Gabriel might well create a dichotomy, shifting the paradigm within the heavily charged group dynamic as there has been a sense of inertia prior to his arrival. Will infighting and competition shift to compassion and concern? Is Gabriel the answer to their prayers, or does he seal their fate? Any explanation seems plausible, as once Gabriel regains consciousness, he seems to know nothing of the war, of Germany or England, yet speaks both languages fluently. Was he an angel, sent with a message from G-d for balance, truth and peace? Or was he merely created from the mystical mind of a precocious 10 year old girl, living in a metaphysical world, seeking some meaning and completion in their now complex lives? Each of the women in the play imprint their own reality and interpretation onto Gabriel, at times with unexpected consequences, potentially not always positive. Confused by their changing identities during these frightening times of war, Gabriel represents lightness and hope. Christopher Williams has been the Associate Artistic Director of the NCRT since 2016 and part of about 25 mainstage shows since 2003 as actor, director, assistant director or stage manager. He believes in a collaborative interaction between the actors, resulting in a deliverance of a powerful, believable performance. “I have learned many skills in my 20 plus years of experience from amazing artists, learning at an early age to just say “yes” when an opportunity came along, then figuring out how to do it,” she says. Williams produced the WWII film, Walking With the Enemy, starring Jonas Armstrong and Ben Kingsley. He also played Nathan in the original off-Broadway production of Bock and Harnick musical Rothschild and Sons. He was the Founding Artistic Director of the Oceanside Theatre Company, running the managerial side. Over the years, he has acted for the York Theatre Company, Arizona Theatre Company, Phoenix Theatre, Idaho Shakespeare Festival, Actors Theatre, Arizona Jewish Theatre, and Southwest Shakespeare Company. Williams believes theatre presents an opportunity for creating extraordinary moments. “From the moment I read it, I wanted to direct it,” Williams says of Gabriel‘s draw, and his admiration of Moira Buffini’s work. Currently researching the island and what the people experienced during the Nazi occupation, Williams hopes to help inform the intentions of the characters and the world we create on stage. North Coast Repertory Theatre is located at 987 Lomas Santa Fe, Suite D, Solana Beach 92075. For tickets or more information, call the Box Office at (858) 481-1055 or email boxoffice@northcoastrep.org.